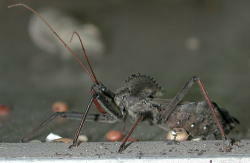 This is a form of assassin bug called the giant wheel bug. BIOLOGY AND LIFE CYCLE: Eggs usually laid singly or in clusters on branches, in crevices, and under stones and the like. 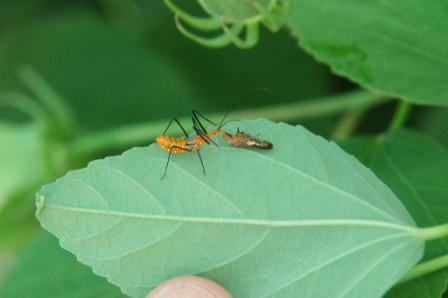 Nymphs are often brightly colored. Incomplete life cycle - with normally one generation per season. Will hibernate in all life forms - eggs, nymphs, and adults.